The Polynesian Cultural Center, which is a top paid attraction to experience Hawaiian culture as a living museum, is also considered to be on the North Shore, but that is on the east coast of Oahu. 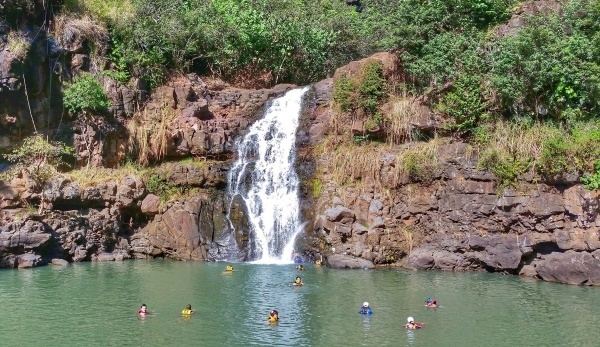 Generally when tourists and visitors to Oahu are looking to go to the North Shore, they are thinking about the North Shore that’s on the west coast of the north side of Oahu… which is where you’ll find Waimea Valley! You can expect the price for Waimea Valley admission to be around $16 per person. There is also a parking lot here that you can park for free. For updated information about admission fees and park hours, have a look here. Just across the street from Waimea Valley, you’ll find Waimea Bay which is most famous as a surfing spot in the winter. During the summer, if the waves are calm, it can be one of the best spots for snorkeling on the North Shore too. So, what is there to do at Waimea Valley?! Now, here’s a bit more about what you can find at Waimea Valley! 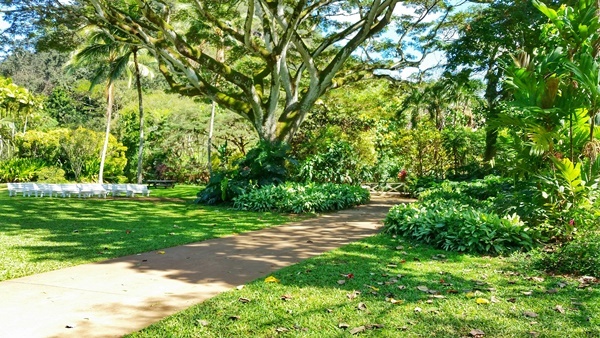 One of the main draws to Waimea Valley is the botanical garden. So if you’re a nature lover who loves exploring flowers and plants, there will be a lot of nature walking for you! This park has over 40 themed gardens and over 5,000 different types of plants. Here’s more info about the native plants you can see at the nature park, and here’s info about more botanical collections. 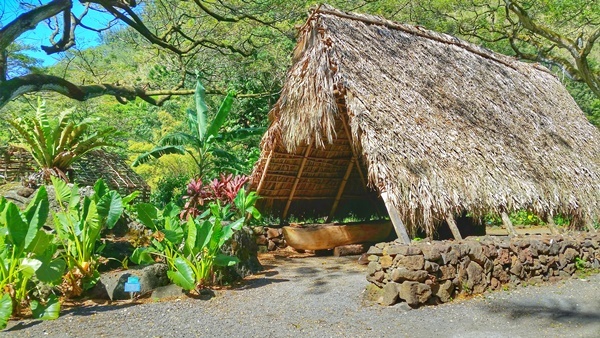 You can also learn a little bit about Hawaiian culture at Waimea Valley with the section of the park that is dedicated to a Hawaiian ancient living site. 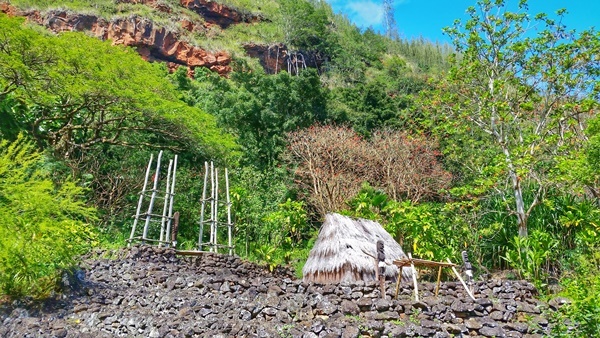 Here you can get a glimpse into how native Hawaiians lived long ago. When you’re in Hawaii, try to make it a point to visit at least one Hawaiian culture site. The Waimea Falls Hike is a popular hiking trail that refers to the paved trail that goes through the Waimea Valley nature park. Your destination is the waterfalls! This is one of the popular waterfalls on Oahu. There’s a pond at the bottom of the waterfalls that you can go swimming in. To do so, you’ll need to be wearing a life jacket, which are offered near the waterfalls. You also might thank yourself for bringing along water shoes to Waimea Falls, for a similar reason that you might want them for snorkeling too – a rocky water entrance to avoid cuts on your feet! See comments about this from fellow pinners about swimming at the waterfalls. You can take a look at this Hawaiian ancient temple, called a heiau, at the beginning of your visit, or at the end. 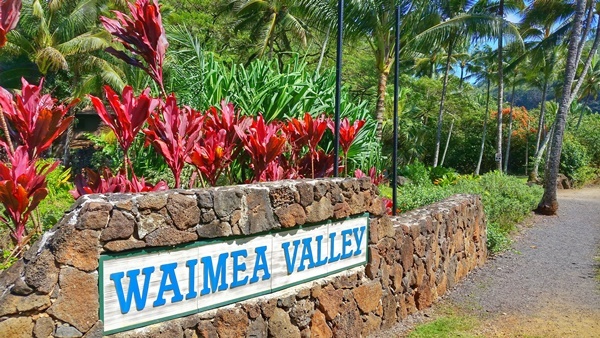 This is located near the parking lot before you enter the Waimea Valley admission area. This heiau is estimated to have been built some time between the years 1470 and 1700. For more information about Waimea Valley on the North Shore, here’s the official website.